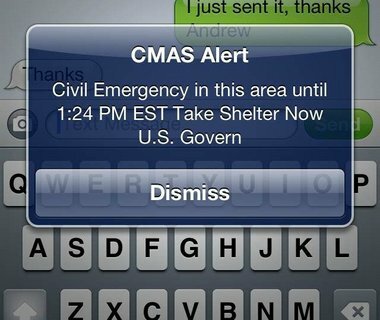 As part of a “test emergency notification,” Verizon Wireless sent out a mass text to its customers in New Jersey warning of a civil emergency and imploring them to take shelter. Unfortunately, as you can see, the text wasn’t clearly identified and caused a bit of a panic. Normally, when the Emergency Broadcast System does their beep test (used to scare me as a kid, still does), they tell you multiple times, “It’s only a test. It’s only a test. Hey idiot, if you’re calling 911, this is only a test.” They do this because people get frightened. I can’t even imagine the number of calls to the police this caused. I’m not blaming people for being panicky. I’m the biggest wuss in the world. If I got this text message, I would be halfway to Canada by now, sobbing into an American flag. I’m actually surprised this didn’t create more of an uproar. Apparently earlier in the week, a few houses in the area shook with no explanation. That’s poop-your-pants frightening. Who knows what it could have been. Nuclear meltdown, biological attack, or even a (gasp!) alien invasion. Verizon, baby, you weren’t trying to scare anyone, but man, wait till April Fool’s Day until you do your next emergency test. Or even just put “THIS IS ONLY A TEST” anywhere in the fricking text. This isn’t the 90’s anymore. I hear a low-flying plane and I’m ready to run. I know you issued an apology but try to be a little more careful next time. You wouldn’t want there to be an actual emergency and nobody believes the warning text. Although it is New Jersey. Until then, you’re a jabroni, brother.